A joint plan prepared by Alexandria Renew Enterprises (AlexRenew) and the City of Alexandria outlining an approach to remediate a portion of Alexandria’s sewer system built in the late 1800s was been accepted by the Virginia Department of Environmental Quality (DEQ), AlexRenew announced on July 2. The plan outlines the construction of infrastructure improvements to remediate four outfalls in Alexandria that currently discharge a mixture of rainwater and sewage into Alexandria’s rivers and streams during rain events. DEQ has issued a letter stating that the plan is compliant with the Virginia General Assembly legislation passed in April 2017 requiring that discharges from the four outfalls be remediated by July 1, 2025. The acceptance of the plan marks a major milestone in complying with the legislation. The plan’s infrastructure includes construction of a deep tunnel system, approximately two miles long, and new sewer infrastructure to connect the tunnels to the existing sewer system. The plan also includes upgrades to AlexRenew’s Water Resource Recovery Facility to pump and treat wastewater collected in the tunnels. Once completed, the new tunnel system will connect to the existing outfalls to prevent millions of gallons of sewage mixed with rainwater from reaching our rivers and streams. Instead of polluting waterways, the sewage and rainwater mixture will be captured by the tunnel system and conveyed to AlexRenew’s Water Resource Recovery Facility to be transformed into clean water and returned to the Potomac River. When the plan is complete, it is estimated to reduce the occurrence of discharges from approximately 60 to less than four times per year, on average. The significant reduction in the frequency and volume of these discharges will achieve cleaner, healthier waterways by reducing the amount of bacteria, trash, and other pollutants that currently impact Hooffs Run, Hunting Creek, and the Potomac River. AlexRenew, in a partnership with the City of Alexandria, will lead the planning, design, and implementation of the plan to remediate the outfalls by 2025. AlexRenew has served Alexandria and portions of Fairfax County for over 60 years, conveying and transforming used and dirty water into clean and safe water. AlexRenew’s Water Resource Recovery Facility is a vital component to the plan since all flows captured by the new infrastructure will be delivered to the facility for treatment. In order to accommodate the additional flows during rain events, AlexRenew will make significant upgrades to its existing debris and bacteria removal treatment processes. 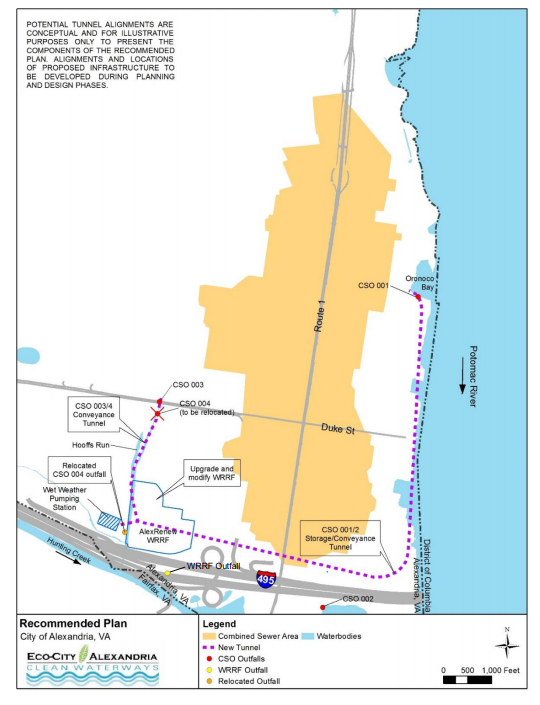 Additionally, in an effort to minimize impacts to the community, the plan proposes that the AlexRenew facility serve as the main construction point for the proposed tunnel system. AlexRenew’s expertise in implementing large-scale treatment projects and its close partnership with the City of Alexandria will ensure that the plan is implemented by 2025. AlexRenew will be conducting an extensive outreach program to ensure that the community and regulatory stakeholders are kept informed as the design for the tunnel system kicks off and is developed. To keep up to date with progress, click here.